An emerging grocery chain, Acme Markets, Inc. is observed to be a rank holding food retailer in entire Philadelphia. They are dealing in the business of vegetable and fruit retailing in the region. The grocery chain is primarily registered as retail and wholesale dealer under private ownership. Corporate office of this retail chain is located in Flourtown, at PA. The business came into being in 1891. The supermarket chain even operates in various regions like Pennsylvania, Maryland, New Jersey and others. Presently, they have more than a hundred supermarkets under Acme banner. An additional service of online grocery marketing had been initiated by the chain. 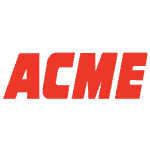 There are currently 0 consumer reviews about Acme Markets Inc available. Share your review. Please take a note that you are about to post a public review about Acme Markets Inc corporate office on CorporateOffice.com. This review will be public, so please do not post any of your personal information on this website. If you would like to contact the corporate offices of Acme Markets Inc, please use their contact information such as their phone number, website, and address listed above to contact them. However, sometimes staff from Acme Markets Inc headquarters do read the reviews on this website.